A long time favorite offered to you in a special wooden hoop. Customers call this premium smoked boneless ham, the filet mignon of hams, 3 lbs. Cut in one solid piece from the best part of the ham, its flavor and texture are unsurpassed. Also included are 4 oz. of our prize-winning aged Vermont cheddar cheese, a 2.75 oz. jar of our homemade hot and sweet mustard, and a 7 oz. 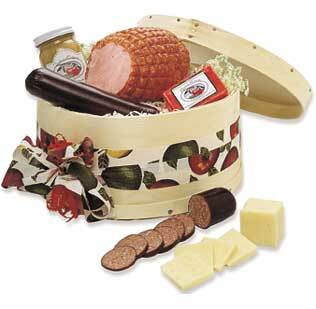 stick of our summer sausage, all packaged in a beautiful hand-crafted wooden cheese hoop.